Groups can be created by teachers, administrators and staff to facilitate communication and collaboration. As an example, groups are created and used to include extra curricular activities, special interest groups, departments, curriculum planning, and parent organizations. The Group locker is for the mutual benefit of all group members. Like all School Loop lockers, files and links may be stored and organized into folders. Group members may upload and access all resources in the locker. 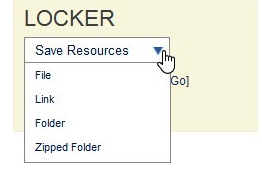 To add resources to the group locker, hover over the blue Save Resources button and then choose to add a file, link, or folder from the drop menu.